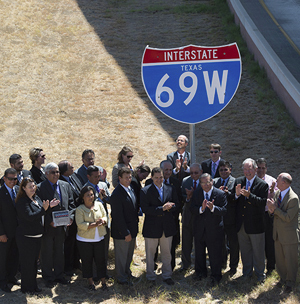 Federal, state and local officials -- joined by an Alliance for I-69 Texas delegation -- held a day of celebration August 25th to mark the unveiling of the first Interstate 69W signs in Laredo. The Texas Transportation Commission and the Federal Highway Administration in June approved designation of a key 1.4-mile section of freeway in Laredo as part of the Interstate 69 system and officially on the Interstate Highway System. Participants in the unveiling ceremony included Congressman Henry Cuellar of Laredo and Transportation Commission Member Jeff Austin who pulled the cord to reveal the red, white and blue shield. The newly designated interstate section means that a total of 188 miles of the I-69 system and connectors have been added to the Interstate Highway System in the past three years. That includes 47 miles of Interstate 2/US 83 in the Rio Grande Valley connecting I-69E and I-69C. The newly designated interstate section begins near the busy World Trade Bridge on the west side of Laredo and extends east to an interchange with Interstate 35. New Interstate 69W signs are going up on this section and on I-35 and other roadways approaching 69W. The Alliance for I-69 Texas was instrumental in working with Laredo community leaders to push for early designation of the new 69W section. Marc Williams, TxDOT director of planning, pointed out that the move means that each end of congressionally designated High Priority 20 – at Laredo and Texarkana – are now part of the national Interstate System. “There is a more to go but this continues significant progress being made on I-69. As a point of reference, while the system is more than 1,000 miles in length, over 140 miles of the corridor have been designated since November of 2011, and the total amount of funding that has been invested in these projects since that time is over $940 million. So it shows tremendous progress to get to this point,” Williams said. He said that it is well understood that I-69 in Texas can’t be done all at one time and that it will be done “little-by-little” in many individual projects. “This adds an exclamation point at Laredo,” he said while noting that the busy truck crossings at Laredo show why I-69 in Texas should be designated at a high priority freight corridor in coming federal legislation. He noted that the length of the I-69 route in Texas is greater than the combined mileage on the national I-69 route through Louisiana, Arkansas, Mississippi, Tennessee, Kentucky and Indiana. He reported on recent discussions he has had about the national I-69 route with leaders of the Arkansas Department of Transportation. Alliance Board Chairman John Thompson took time during the celebration to thank IBC Bank of Laredo for its years of continuous support in helping move the I-69 initiative forward in Texas. He also thanked Jorge Verduzco, a founding member of the Alliance who is retiring from the bank this year. The American Association of State Highway Officials committee that approves the numbering of federal highways voted in April to designate the Laredo highway as Interstate 69 West (69W). The 69W section will eventually run on US 59 from Laredo to Victoria. In South Texas I69 is being created by updating US 59 (69 West), US 281 (69 Central) and US 77 (69 East). The 1991 federal ISTEA highway law designated US Highway 59 from Texarkana to Laredo as part of the national I-69 priority corridor. It did not, however, resolve the question of how I-69 would connect to Interstate 35 and to a major Rio Grande crossing since old US 59 entered Laredo on Saunders St., a busy city arterial street. 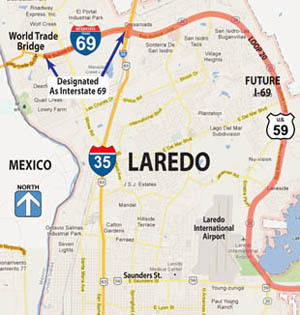 The new designation means that US 59 now enters Laredo from the east near Casa Blanca Lake then turns north running past Laredo International Airport and Texas A&M International University before crossing under Interstate 35 and ending at the busy World Trade Bridge, a distance of 11 miles. regional leaders for over 20 years to advance the development of this international corridor. a freight highway connecting to international border crossings, seaports and other markets. 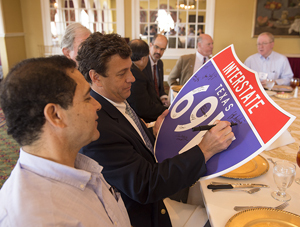 Congressman Henry Cuellar (left) and Transportation Commission Member Jeff Austin III sign an I-69W souvenir sign replica commemorating the day. Representing the Alliance for I-69 Board of Directors were (L-R) Julian Alvarez, Commissioner David Garza, Jorge Verduzco, Judge John Thompson and Alliance Executive Director Jennifer Shepard.